This week my big kids are off at an Olympic themed summer camp and I am having a blast hosting our own toddler Olympics with my toddler. Each day this week we will partnering with Jenae at I Can Teach My Child to share simple and fun Olympics themed activities as part of our A Very Toddler Olympics series. I grew up on the East Coast and my twin sister played field hockey! I was so excited a few years ago when I discovered that field hockey was played in the Olympics. 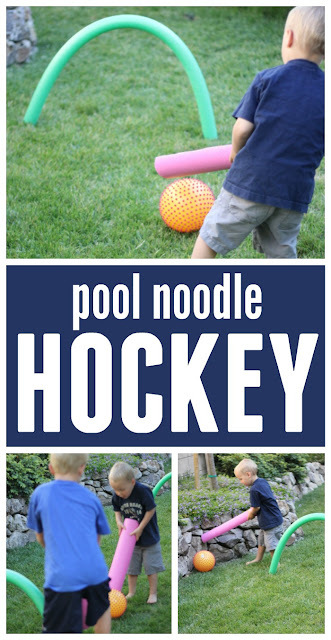 This week I decided to create a simple pool noodle hockey game to play with my kids for our Olympics series. Did you know that Hockey is the oldest known ball and stick game? During the Summer Olympics there are mens and womens field hockey teams. They play with a stick that has a shepherd's crook on it and hit a small ball. 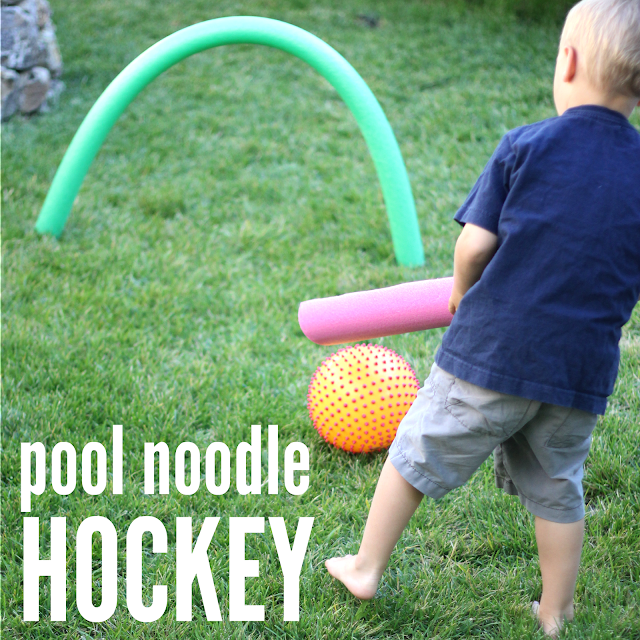 For our pool noodle hockey game I created goals and sticks using pool noodles. Scroll down for more details. Set up is super easy! Start by putting two yard stakes in the ground about 2ft away from one another. Put them in the ground deep enough to stay but leave them high enough out of the ground that several inches are visible. 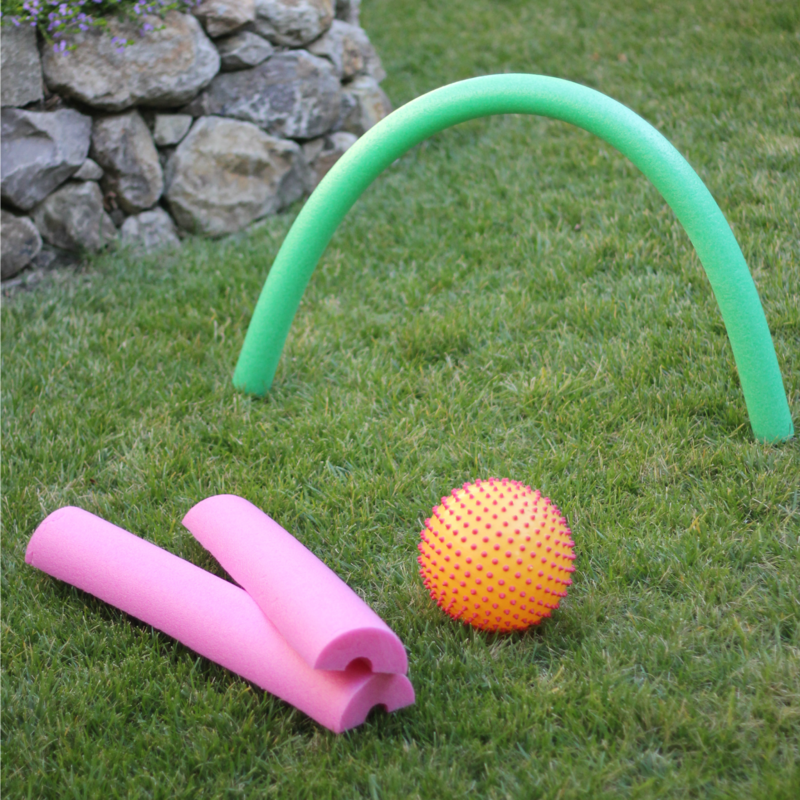 Arch one pool noodle from one yard stake to the other and slip the yard stakes into the centers of the pool noodle ends. The pool noodle should make an arch and stay pretty secure, unless it is super windy. Repeat with another pool noodle maybe 10-15 ft away (depending on how large of a field you want). Next, cut the fat pool noodle in half lengthwise. The cut side of the pool noodle is a bit easier to hold on to and it is easier to hit balls with the fat pool noodle pieces. We made small teams of one and worked hard to get the ball in the other goal before it was stolen! Using the pool noodle half we hit the large ball again and again. My son was so proud of himself once he figured out how to "dribble" the ball up the field using his pool noodle. It is fun to get the entire body into pool noodle hockey, which was why we set some ground rules to begin with. We encouraged kids to keep their sticks on the ground or close to it when they were hitting the ball (no high sticking) and to keep their bodies to themselves (no fouls)! This activity is great for working on hand-eye coordination, aiming, swinging, and working together. Hockey is a fun fast-paced game and I can't wait to watch it during the 2016 Rio Olympics!! Do you have a favorite Olympic sport that you can't wait to watch? Make sure you head over to I Can Teach my Child to check out Jenae's Olympic Ring bracelet.